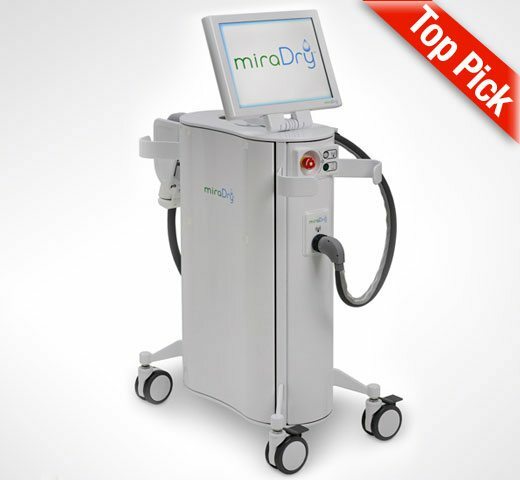 miraDry is an FDA-approved device that we use for underarm sweat reduction. It also safely and effectively reduces hair and odor in the underarms. For people who are concerned about the chemicals found in more traditional products, miraDry is a permanent solution and will eliminate the need for antiperspirants & deodorants! It’s also a very popular treatment amongst those who struggle with excessive axillary (underarm) hyperhidrosis, usually resulting in a life-changing improvement. If you’re interested in miraDry treatment for sweat reduction, you’ll need to see one of our physicians for a consultation. They’ll go over a series of questions with you and discuss what you should expect from the miraDry procedure. However, anyone who is bothered by excessive underarm sweating is considered a good candidate for this treatment. You do not have to have a medical diagnosis of hyperhidrosis in order to have this procedure. It’s also FDA-approved for reducing hair by 60-70% in the underarms. What is miraDry treatment like? The first step will be to get you into a comfortable, reclined position. You’ll be laid back with your arms resting on a support (similar to laying on the couch with your hands behind your head) throughout the treatment. A temporary tattoo template is then applied to each underarm, which is just a guide used for the procedure. Finally, your underarms will be numbed. We know this thought makes some people feel a bit nervous, but rest assured, every effort will be made to keep you comfortable! Most patients report feeling nothing beyond the first couple of needle pricks. Finally, once the numbing is complete the treatment will begin and takes about one hour. Does miraDry hurt? What are the side effects & downtime? No, it doesn’t hurt. Since your underarms will be numb for the treatment, it’s unlikely that you’ll feel anything at all! miraDry side effects are mild to moderate, and well-tolerated by most patients. In the first couple of days after treatment some swelling, tenderness, bruising, tingling and/or numbness in the underarms is normal and should be expected. We’ll discuss these side effects with you and explain how to manage them at home. Finally, there is very little downtime with miraDry and after treatment you will be able to resume your normal daily activities right away. As a result of the commonly expected side effects, you may want to limit your exercise routine for a few days post-treatment. However, this isn’t a requirement, only a suggestion to improve your comfort. How quickly will I get results? How long does miraDry last? You’ll notice an immediate reduction in your underarm sweating. How much improvement you’ll get varies from person to person, but generally speaking, a 60-80% reduction in underarm sweat can be expected. For most patients, one session is able to provide enough improvement and no further treatment is necessary. However, a small percentage of people do ultimately need a second miraDry session in order to get maximum benefit. Best of all, the sweat & odor glands destroyed during the procedure will never regenerate, so the results are permanent!